Our gift vouchers would make an excellent treat for birthdays, a Christmas gift or for any other special occasion coming up where you are treating a loved one. Why not treat them to a unique experience at Raheen House Hotel in Co. Tipperary so that they can enjoy a country break in luxury and style. Please note that our gift vouchers cannot be redeemed online, they are available for purchase online only. Recipients of our gift vouchers are advised to book promptly to ensure getting the best available rate. Vouchers are valid for 6 months from the date of issue. 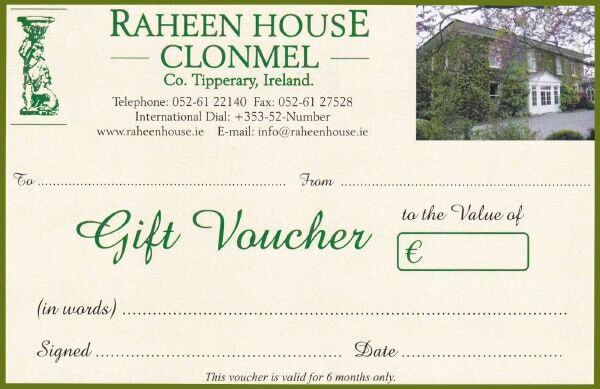 You can contact our reservations team at info@raheenhouse.ie to find out more information about our gift vouchers. Raheen House Hotel uses Stripe to secure your payment details for every transaction. All transactions are in euro.